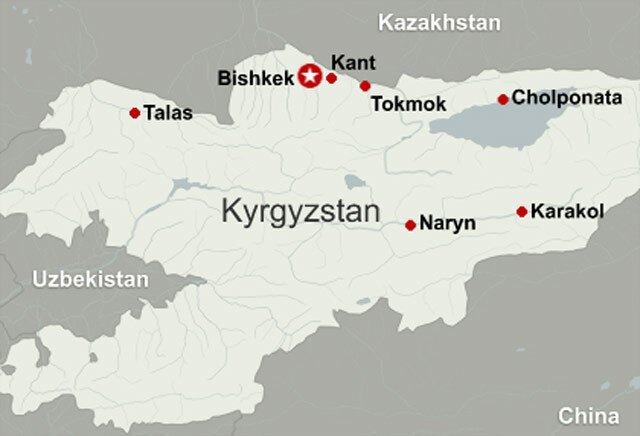 Bishkek, Kyrgyzstan (CNN) -- The Kyrgyz president said Thursday he would not resign despite the opposition's assertion that it had ousted the government following days of bloody civil unrest in the central Asian nation. President Kurmanbek Bakiev acknowledged that there had been a coup against him but said in a statement that he was not abandoning his duties. "I am prepared to bear responsibility for the tragic events that have happened if it will be proven by an objective and unbiased recognition without hiding behind the presidential immunity. I believe I acted in the way that the constitution required," Bakiev said in his statement, posted on 24.kg, a well-known Kyrgyz Web site. A wave of protests have left 75 people dead and hundreds injured in fighting between police and protesters, authorities said. The opposition seized government headquarters and pledged to address citizens' concerns. Bishkek, the capital, was relatively calm Thursday. There were small groups of people chanting near the marble government office, known as the white house. One report said a crowd was rallying outside the telephone company in the capital, and that demonstrators blocked roads and obstructed traffic, prompting concern from health officials. As darkness fell, sporadic bursts of machine gun fire and police sirens could be heard. It was not immediately known why there was shooting, but a major concern of the new interim government officials is widespread looting. Ismail Isakov, the interim interior minister, said on television he ordered police to shoot people looting shops, businesses and houses of former top officials. And, officials have urged citizens to band together to stop looters. In his statement, Bakiev said, the country has endured "loss" as a result of opposition leaders' "irresponsible actions." "Innocent people have died... I am shocked by the tragedy and express deep and sincere condolences to the families of those dead. Today, the attention of the entire world is attracted to the bloody events happening in Kyrgyzstan." Bakiev said it was "clear" to the world that there had been a coup in which "our countrymen have paid the price." "I am confident that those who are attempting to change the authority in the country should act strictly within the framework of law and according to the existing constitution. "Realizing my responsibilities as president of the Kyrgyz republic, I am confident the country where the government comes to power through blood can lose its statehood. I am urging the instigators of the riots to think again. I am stating that as president I did not abandon my duties and I am not abandoning my duties. Irresponsible actions of the opposition could only cause more escalation of tensions." Roza Otunbayeva, a former foreign minister, said the opposition had taken over the reins of government and driven Bakiev from office. "We must restore a lot of things that have been wrongly ruled," said Otunbayeva, who declared herself the country's interim leader. Otunbayeva said at a news conference that the former president had fled to the south of the country with his entourage. "The new government would like to locate him to negotiate the terms of his resignation," she said, adding that Bakiev is trying to consolidate his supporters to help restore his power. "We will not let him come back to power," said Abdygany Erkebayev, a former parliament speaker and opposition figure. Resources: Hydropower; gold and rare earth metals. Religion: Muslim 75 percent, Russian Orthodox 20 percent. Economy: Cotton, tobacco are the main agricultural products. Industrial exports include gold, mercury, uranium, natural gas, and electricity. Main export partners: Switzerland, Russia. Main import partners: Russia, China. Otunbayeva added that the former prime minister had handed a resignation letter, and the interim government was now in control based on the constitution. She said the new body replaces the president and cabinet ministers. The interim government is working to restore order across the country. Ismail Isakov, the interim interior minister, said on television he has given orders to shoot looters. Opposition leaders have accused Bakiev of consolidating power by keeping key economic and security posts in the hands of relatives or close associates. The protests began Tuesday in the northern city of Talas. They were sparked by increases in electric and fuel rates, which had gone up at the first of the year as Bakiev's government sold public utilities to companies controlled by his friends. Demonstrations spread to the capital Wednesday after the government arrested opposition leaders in Talas. Otunbayeva discussed a list of priorities the new government would focus on, including restoring the old utility company. The government also said it had taken control of television stations and most businesses owned by the former president's son, including banking and mobile services. Kyrgyzstan, a former Soviet republic, houses an air base that forms an important link in the supply line for United States and NATO forces in nearby Afghanistan. The new government denied reports that it was planning to shut down the air base, but said it intends to review the issue. In Washington, a senior Pentagon official told CNN that the turmoil had interrupted flights into and out of that facility, and it was unclear when those flights would resume. But the U.S. military has contingency plans to deal with the situation, the official said. On Thursday, a senior State Department official said Washington was closing its embassy in Bishkek and may move dependents onto the air base as a safety precaution. The United States has closed its embassy in Bishkek, a senior State Department official said Thursday, and the country is contemplating moving dependents to the Manas air base for a few days because of concern about the political violence that has engulfed the country. "We have concerns about the situation on the ground," U.S. State Department spokesman P.J. Crowley said at a Thursday briefing. "We stand with the people of Kyrgyzstan. We understand that there were specific grievances that resulted in the demonstrations that have produced an opposition that now says that it has effective control of the government." Crowley said the United States is not taking sides. "Our interest here is with the people of Kyrgyzstan and a peaceful resolution of the situation." As the protests died down, the interim government said it was monitoring the situation to ensure no more violence. Otunbayeva is the head of the Social Democratic Party and a member of the parliament. She was a leader of the protests that brought Bakiev to power in 2005 and served as his foreign minister for about two years before quitting to protest over the appointment of one of the president's brothers to an ambassadorship, said Mirsulzhan Namazaliev, executive director of the Central Asian Free Market Institute in Bishkek. On Thursday, the Organization for Security and Co-operation in Europe urged citizens to refrain from violence and to use dialogue to address their concerns. The group's special envoy to the country, Zhanybek Karibzhanov, is expected to arrive in Bishkek shortly.